If you've been on the "scavi" tour underneath St. Peter's you know that it ends up here, at the Clementine Chapel.This chapel is directly behind the "confessio" and is also called "St. Peter's Chapel" since it is very close to where the bones of St. Peter are located. On my early morning visit to St. Peter's this morning it happened that Mass was being celebrated here in the Clementine Chapel in English by five American priests. I joined them. At the end of the Mass several of the priests introduced themselves, the celebrant was from Baltimore and was also a Knight of Malta, another priest on hearing that I was from Indiana mentioned that he also was in fact a Holy Cross priest from Notre Dame. Several others were pointing under the altar and making references to the "scavi" tour (which I hadn't taken as yet, but in fact would be taking later this same morning). Leaving the Clementine Chapel, I made my way around the semicircular series of chapels and stopped at the Polish one (after all I am half Polish). Here I prayed the office for the day, as well as said prayers for my Polish relatives both living and deceased. I could hear Mass being celebrated in Polish in near the tomb of Pope John Paul II, and I made my way towards his tomb to pray the mysteries of the rosary that he will forever be known for--the Luminious Mysteries prayed on Thursdays. Behind me in the chapel that is between the tombs of the popes, the Mass in Polish was concluding and a Polish bishop with several Polish priests came around and the security guard stationed at the tomb of Pope John Paul II removed the rope that keeps pilgrims from approaching the actual grave. The bishop and priests went in and knelt at the head of the tomb and said a few prayers. One of the priests took a camera and stepped back to take a picture of the bishop praying at the tomb. 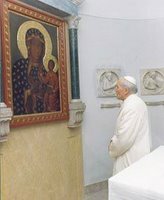 Then they left and the people behind me pushed me forward and we were within the niche and I found myself kneeling at the head of the tomb with my hands and the rosary resting on slab that covers the Pope's resting place. I was in the middle of the Fourth Luminous Mystery, "The Transfiguration" and as always I prayed the petition of St. Peter that I might always be able to discern "Lord, it is good that we are here." I said a special prayer of petition for several people who entered my mind at that moment. One was for the husband of Johnnette Benkovic, another was for the brother of Bishop Robert Baker, the third was for the souls of my Polish relatives: great grandparents, grandparents, aunts and uncles, and cousin. I then arose to make room so that other Polish pilgrims could enter. Returning back to the apartment, we had to move quickly to go back to St. Peter's so that Katie and Amy could take the scavi tour, I would take the tour right after them (children aren't allowed for obvious reasons). We left Amy and Katie at the Swiss Guards and then Joseph and Michael on my back went into the Vatican bookstore (I bought a Vatican phone book and some holy cards), then into the Vatican post office, then out of St. Peter's to the many gift shops that surround the area. I also had to find something that Joseph would eat for breakfast, no easy task I might add. We bought water and I think M & M's (a breakfast he enjoyed). We walked in a number of gift shops and bookstores, buying nothing. The women in the stores tried to get Michael the baby to wave, smile, make sounds etc. while I tried to keep Joseph from picking up ceramic and glass objects. Finally it was time to trade off both baby and four year old which we did at the Swiss Guard station and I made my way to the Scavi Office. We had worried that our tours were scheduled too tight but it turned out there was plenty of time between tours. It also turned out that later when I was doing my imitation of the tour guide (who was excellent) that we had the same one. I've often found that if someone is really, really good that my mind is like a camera and I can imitate not only what they said, but how they said and what they were doing as they said it. Anyway I waited outside of the office with a large group that included one "loud" American who was smoking and pontificating (what else do you do when you are in Rome?) about how they weren't able to do the tour at the time I was doing it but that Father somebody might be able to change that (I hoped that he was wrong and thankfully he was...btw the same guy by himself showed up at the Scholars Pub for Amy's TOT, never found who he was or where he was from though). The Scavi tour isn't advertised and you can't sign up for it when you are in Rome, you have to do it before (several weeks before). So it isn't crowded, I think there were maybe six or seven people on my tour. It was also the one thing that a number of people who've been to Rome said was a must. 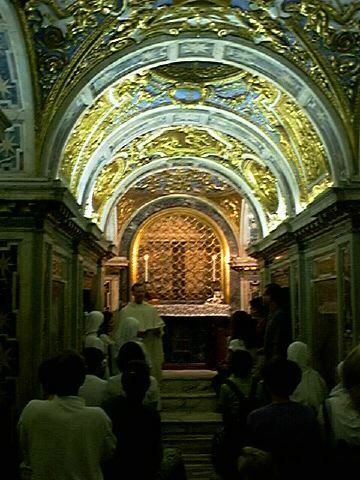 What it is, is a tour of the ancient Roman graves that were discovered under St. Peter's when Pope Pius XII began an archealogical dig to find out if Peter was in fact buried here. The necropolis is impressive enough (those walking in the crypt of St. Peter's where there are countless Pope's buried probably for the most part are unaware that below them is another graveyard even more ancient). The tour takes you through these graves and also explains the history of the churches built on this spot. It all culminates once you leave the graves and come to the spot where tradition says Peter's bones were buried and then suspense--the bones weren't found where they were expected. Then a walk into the Clementine Chapel (the same chapel pictured above and where I had been to Mass earlier that morning)...the tour guide mentioned that Pope Benedict XVI had said Mass in this chapel eight days ago. Then into another room with a glass floor and glass wall. The bones of Peter were discovered wrapped in royal purple cloth in a tomb built by Constantine under the altar of the first church. What was missing? His feet, the rationale that when Peter was crucified upside down that those who removed his body just cut his feet off in order to remove him from the cross. The whole trip was very moving and highly educational. A few seconds later we were deposited at the tomb of Pope John Paul II again.